Volunteers with Operation Kid Comfort in Killeen display a quilt for a local military child. 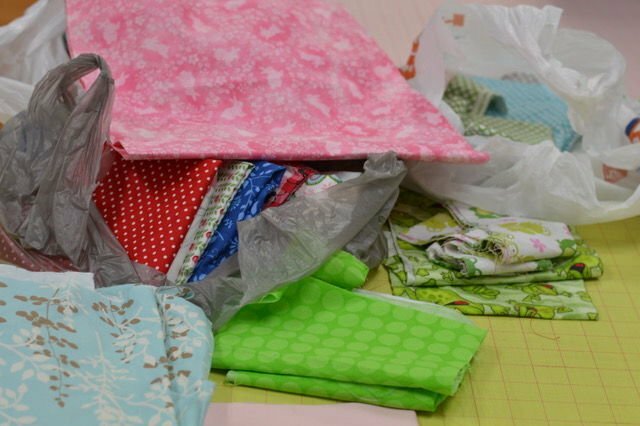 Fabric, scissors and ruler on the table, the repetitive whirring of sewing machines in the background, the smell of fresh donuts and coffee in the air — the quilt ladies from the Armed Services YMCA work hard to keep up with their orders for Operation Kid Comfort. The program started in May 2009 and is going strong. Operation Kid Comfort provides a free photo quilt for children 6 years old and younger and one pillow sham for children 7 years old and older. The hand-crafted quilts and pillows help children cope with emotional stress during their parent’s deployment. 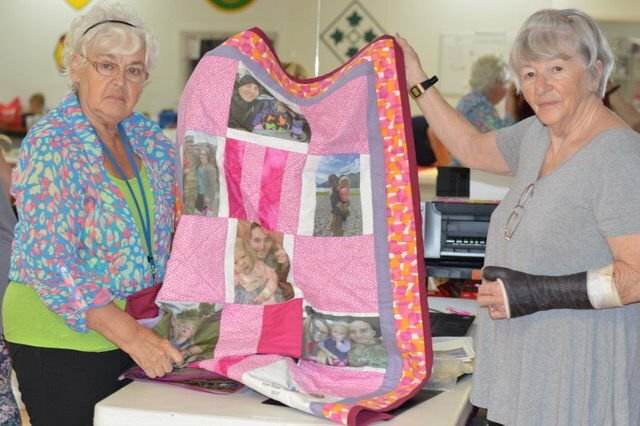 “I have been with this program for almost nine years … and we’ve done over 6,000 quilts and pillow shams so far,” said lead quilter Siglinde Moore. With soldiers continuously deploying and leaving their families behind the demand is constantly high. According to Moore, it takes about six hours to finish one quilt — from printing out photographs of the deployed parent to incorporating the final stitches on the blanket or pillow. To keep up with the demand, the volunteers meet every Wednesday at the Armed Services YMCA main office on 415 N Eighth St., in Killeen. Due to changing duty stations, the group has a constant turnover and is always looking for new volunteers. Special skills are not required. Interested volunteers can also sign up through the Military One Source center at Fort Hood to receive free child care for preschool-age children during their volunteer time. While the Armed Services YMCA provides the sewing machines, all necessary materials are donations. Interested parents can request a quilt online at the Armed Services YMCA website: www.asymca.org/killeen-operation-kid-comfort. Depending on the number of requests, it can take a couple of weeks for quilt and pillow shams to be completed for each family. However, waiting for the final product is well worth it. The ladies get inspiration from the personal pictures sent in to match the individual’s style and preference in color and pattern of the fabric. “Once the quilts are done, we contact them via phone or email if they are in the Killeen area to pick them up,” Diekman said. The highlight of the day for volunteers is seeing the excited faces of children receiving their quilt or pillow sham. Operation Kid Comfort is one of the Armed Services YMCA core programs, which aim to support the children within the military community — with no end in sight. “We want to continue to give back to our active-duty soldiers and their families … and as long as kids need to be cared for … we continue to do this to show we do care,” said John Marshall, Armed Services YMCA marketing director in Killeen. Without the great dedication of volunteers, the program would not be possible to this extent. Since most of the ladies are either spouses or veterans, they feel a special connection to the program.